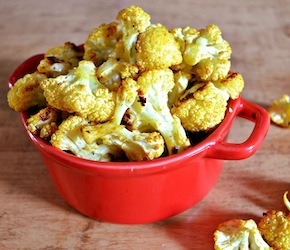 Once cauliflower is separated into small florets, melt butter in a saucepan over low heat. Once just melted, remove from heat and whisk in spices and salt. In a large bowl, add cauliflower pieces and drizzle butter sauce on top. Mix with hands so all the florets get coated with sauce. Lay prepared florets onto a parchment lined baking tray and roast in a 400 F oven for 25-30 minutes, removing once to give a quick stir.